The recent string of New Super Mario Bros. games have struck a chord with a lot of Nintendo fans, but not always on a positive note. What was originally meant to be a fun little throwback to the old days of the series has become the norm by which Mario games are made, and the once shining beacon of pioneering ingenuity has hit a monotonous stride many fans believe has gone on way too long. The New Super Mario Bros. games have each been pretty well received by critics and gamers, but are more of a commercial success than a critical one. None in the series has matched the universal praise of the two Super Mario Galaxy games released for the Wii or even Super Mario 3D Land released just last year for the 3Ds. However, New Super Mario Bros. Wii sold over 26 million units worldwide, more than quadrupling the sales of Super Mario Galaxy 2‘s numbers of only 6.4 million. New Super Mario Bros 2‘s less than stellar reception has critics claiming a sense of “been there done that.” In regard to the similarities between it and New Super Mario Bros. U, Iwata doesn’t believe there is room for concern. Sorry for Iwata, but I was confused for the longest time about these two games after Nintendo’s puzzling E3 announcements, and I still see very little difference between their design, art direction, and core mechanics. One’s just very yellow with a tiring coin gimmick. Of course, this could just be the ignorant opinion of a cranky aging gamer who remembers the days when a new Mario game was given a three to five year window to simmer and become popular before he would reinvent the industry once again with something entirely new. 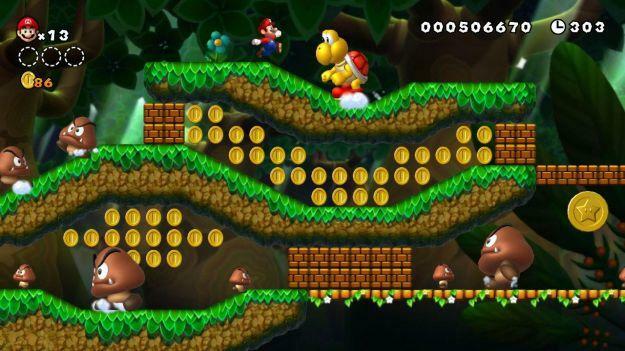 New Super Mario Bros 2 is available now for the Nintendo 3DS, and New Super Mario Bros. U will be available at launch for the Nintendo Wii-U this holiday season.